I've added 7 more funny computer pranks to turn a tool for entertainment and productivity into hilarity! The best part about a computer becoming increasingly more complex is that there is an ever growing number of ways to prank someone. Try them out if you will, and remember to share you prank stories with us! This is an awesome piece of free productivity software! AutoHotkey modifies what your keys do so that you can do a series of complicated keystrokes and mouse-clicks with one button or by typing out a word. This feature opens up a whole new world for funny computer pranks. For example, you can reassign the 'z' key to print out 'x' and vice versa. I've tried replacing common words like 'report' so that Autohotkey will replace it with 'report' AND caps-lock. Anything after 'report' comes back in CAPS so imagine the bewilderment of your victim. Best of all, you can further customize the keys to work on specific programs, like notepad only, for instance. Work that to your advantage. Oh yeah, by the way, you won't need to install Autohotkeys on your victim's computer for this to work. You can easily convert your script into a '.EXE' file that you can run on your victim's computer. Great for use at work or at home. Click here to download AutoHotkey (opens new window). Fool your victim into believing that his LCD screen has cracked! 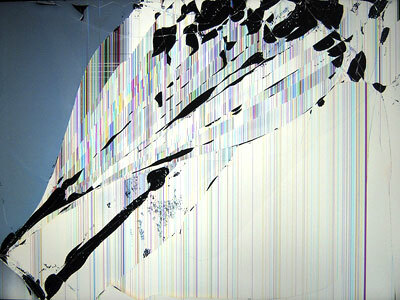 Search for a cracked LCD photo on the web and set it as his screen-saver or wallpaper. If you're setting it as the wallpaper, be sure to hide the desktop icons by 'right clicking on the desktop->Arrange Icons By' and unchecking 'Show Desktop Icons'. Then hide the taskbar and mouse cursor from view. I've tried it and it looks realistic at first glance, so expect your victim to panic. I've included a rather realistic cracked screen image above. Be sure to use the stretch wallpaper setting for this to work. Dvorak an alternative keyboard layout that you can use to bewilder your victim. For instance, when your victim tries to get a '?' on a standard keyboard, a "_" comes out instead. Now the great part is that you can easily switch from one layout to another quite easily. If your victim asks you to take a look at the "problem", you can discreetly switch the layout and show them no problem! If you do it right, you'll keep them fooled for months with this funny computer prank. To learn how to set up a Dvorak Keyboard, click here (opens new window). Click on the 'Key settings' button to set the key sequence to use to change between keyboard layouts. Want another alternative that messes with punctuation and some letters? Try the Romanian keyboard layout. It's almost the same as the standard keyboard, except that 'y' and 'z' are swapped. Setup a VNC server on your victim's computer and you'll get full control of it. You'll be able to launch software or add in keystrokes while your victim is typing. Heck, you can even see what they're doing so you can pretend to be his computer. Virtually any VNC software will do the job, and to my knowledge. All of them require installation, so this prank probably shouldn't be played at the office as it could get you fired due to security concerns. It's better to keep this to your friends and loved ones at home. Click here to get a free VNC server and viewer (opens new window). Did you know Microsoft Outlook allows you to sort mail by setting up rules? It turns out that you can do a lot of stuff with the rules, like starting up a program or shutting down the computer, for instance. Setup a rule to shutdown the computer when there's a specific word or phrase in an incoming e-mail subject, for example. There's already a great page up to show you how to do that, so I won't be too detailed here with instructions to enable this funny computer prank. To read the blog article by Bossmanthe, click here (opens new window). By the way, it only works for any e-mail received via Microsoft Outlook installed in your victim's computer, not any web based e-mail such as Hotmail, Google or Yahoo mail. "The Clapper" is a sound activated switch for any devices plugged into it. Get one and plug your victim's monitor (preferable) power cable into "The Clapper", then plug the device into the power socket. Now randomly clap throughout the day to turn off your victim's screen. Clap again to turn it back on when he goes off to get help. Don't do it too often unless you want your victim to catch on to your prank quickly! Avoid plugging in the CPU power plug into "The Clapper" as turning off the computer suddenly may cause your victim to lose work (that's no longer a funny computer prank). If he's written a 10 page report without saving and loses that, you can be sure he'll be furious with you! Enjoy these funny computer pranks and remember to share your stories with us!